We’d love your help. Let us know what’s wrong with this preview of Sleep With One Eye Open by Beau Johnston. The Zombie Apocalypse doesn’t start in America, China or Europe. It begins in our own backyard; Sydney, Australia. It’s 2019 and the annual Zombie Horde Parade is about to commence in Sydney. Instead of the usual cast of jovial participants in fancy dress, the Sydney City CBD is inundated by a horde of zombies flooding out from the underground train station in Hyde Park and The Zombie Apocalypse doesn’t start in America, China or Europe. It begins in our own backyard; Sydney, Australia. It’s 2019 and the annual Zombie Horde Parade is about to commence in Sydney. Instead of the usual cast of jovial participants in fancy dress, the Sydney City CBD is inundated by a horde of zombies flooding out from the underground train station in Hyde Park and rampaging into an unsuspecting public. A large scale brawl erupts in the CBD as people suddenly realise that they aren’t just defending themselves, they’re fighting for their lives. We follow John’s journey as he tries to escape the carnage and savagery. By the time he reaches safety, the media have only sketchy reports of the morning’s events; while the police and riot squad are at a loss to understand the motives of the group responsible for the lethal riot that continues to rage. No matter who John runs into, their story is always the same; they were attacked by a group of psychopaths with an unrelenting thirst for violence and murder. The scourge of the undead rapidly spreads across the city as people make things worse by engaging in looting and vigilantism. With their attention diverted from the real enemy, hordes of zombies easily overrun entire suburbs within hours. Just when things look to be at their worst, the entire city is plunged into a blackout, allowing looters and thugs to add to the increasingly insurmountable difficulties people are already facing. John’s struggle to survive begins with the knowledge that nowhere is completely safe. Published January 23rd 2014 by Amazon Digital Services, Inc.
To ask other readers questions about Sleep With One Eye Open, please sign up. When I wrote this story, I wanted it to be unique. Ignoring the fact that the book is about zombies, I’ve tried to keep the story as realistic as possible. 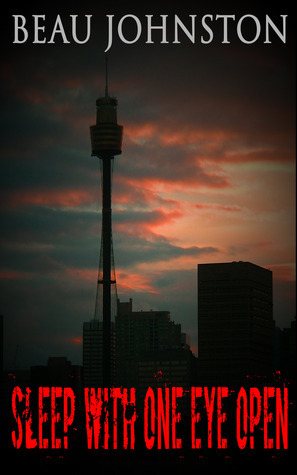 Sleep With One Eye Open is set in Australia, providing a rarely used background for my story. To keep things interesting I incorporated Australia's very strict gun control and gun ownership laws. This means the main character is unlikely to stumble across the caches of high-powered (and often military grade) firearms that appear in other book When I wrote this story, I wanted it to be unique. Ignoring the fact that the book is about zombies, I’ve tried to keep the story as realistic as possible. Sleep With One Eye Open is set in Australia, providing a rarely used background for my story. To keep things interesting I incorporated Australia's very strict gun control and gun ownership laws. This means the main character is unlikely to stumble across the caches of high-powered (and often military grade) firearms that appear in other books in the zombie genre. As such, there won't be head-shot after head-shot to eliminate the approaching horde of undead. (Have you ever tried to shoot a target about the size of a cantaloupe? Now put that target 50 or 100 or 200 or even 500 meters away. Now get this tiny target to wobble along at an unsteady shamble. Now factor in a cross breeze. That sort of accuracy is the stuff of legends. I know I couldn't pull it off; I haven't had that level of training). The main character in my story has to rely on basic disaster preparedness and his self-defense training. The same sort of knowledge that is available to any member of the public if they are willing to dedicate the time to learn. The story starts in Sydney, Australia; but I can't disclose where it goes from there without giving too much away. If you aren't familiar with the Australian countryside (or would like to know more), this story is guaranteed to satisfy your curiosity. I found the biggest challenge was writing the self-defense and fight sequences. Compared to writing, teaching self-defense is easy. Putting the action into easily understood words and phrases was difficult at times, but very rewarding. First, the wildlife of Australia wants you dead! Now the zombies join in the fun! A survivalist guide to getting the hell out of Sydney, Australia, and traveling the Central Coast to find less deadly pastures, hopefully. John is a survival and martial arts expert. He gets caught up in the outbreak in Sydney and he needs to get moving to save his skin. He will live through several adventures going north to find his family. Along the way, he explains a lot of what is needed to make it through the zom First, the wildlife of Australia wants you dead! When you read this book, take the time to follow John's itinerary along the coast with Google maps. What a beautiful looking part of the world! This is Beau Johnston's first novel and he delivers an exciting adventure story written in a clean, simple, and smoothly flowing style. I've been trying to mix up the zombie repertoire--and the last two I read were set in Spain and Ireland, so in this one Australia got a bit more dangerous. This looks self-published and there were formatting things that drove me nuts so maybe it's the printer's fault or something. Also a discovery! Periods following question marks officially drive me insane--I wasn't even aware that was a possibility. "....?". is an abomination. Well how does Australia feature in my tropes checklist? 1) Police &a I've been trying to mix up the zombie repertoire--and the last two I read were set in Spain and Ireland, so in this one Australia got a bit more dangerous. 1) Police & Military turn against populace: nope. There's a few spooky bikers but the police and military seem to have completely crumpled within seconds. The zombies aren't fast or anything that sets them apart from the original "standard." The main character never even seems to see a cop or soldier. 2) Government response is half assed. Well I guess so, since we also don't see any action from the government except for a failed quarantine. There wasn't even a call for safe havens or anything really--except for the one town hall building John encounters. He watches TV obsessively, but we hear very little what is going on in the country--does Australia not have the internet? In today's age, zombies and chaos would be on Facebook and Twitter in a minute. How was the country tricked? Are his parents and cousin all idiots? The outbreak happens on a Zombie Fun run which is actually a nice concept. Jonathan Maberry has done zombie outbreak in horror conventions before, but it makes sense. It is a (very unlikely) scenario where zombies could potentially infiltrate a large group of people, making things tricky for first responders. But we don't get to see the outbreak--we hear about it in a ?. laden awkward dialogue between five people that attended the fun run and got bitten/scratched. Somehow even though the concept of zombies exist in this universe, all the characters but John keep rejecting what's going on, until he has to basically keep a severed zombie head in a bag to show as proof. So a rare and total fail on the part of all media in this book as well. 3) Clergy goes insane. No cannibalistic pervy preachers roaming around in this one. 4) Criminals run amok. Yeah, I guess with the bad bikers, but John and surviving jogger hide in the bushes for all those scenes. And then the raiders later on, which seemed very easy to get out of with a bonus of annoying at how stupid his cousin was. 5) Plucky child. Nope, unless you count the jogger, which I sort of do. For an adult, he acted like a twelve year old that had to be constantly reassured. And do like park league baseball teams have crusty old coaches that mentor them, as adults? I thought all this was a little anticlimactic. Bonus point of zombies on a boat: awarded! They are under all the boats which is actually scarier, and the water and island scenes were the strongest in the book. Probably the whole book would have been stronger if it was in those lines. So 3 out of 5. Wow. What an amazing twist on the classic zombie tale. Very similar in a lot of ways to Night of the Living Dead, in that it's just a man using his wits to defeat the ghouls. The main character John appears at first glance emotionless and stolid, but as the book progresses you see more and more of his underlying goodness and morals. Being set in Australia means the action feels very close to home, and also very believable which gives you extra chills up your spine. I can't wait to visit the places Wow. What an amazing twist on the classic zombie tale. Very similar in a lot of ways to Night of the Living Dead, in that it's just a man using his wits to defeat the ghouls. Being set in Australia means the action feels very close to home, and also very believable which gives you extra chills up your spine. I can't wait to visit the places John went. A friend recommended this book to me because of the realistic way it is written. I loved reading it and recommend it to anyone who likes zombie stories. As well as being resourceful and clever; the main character is believable and likable. This is the best zombie book I have read. The author's written a frighteningly realistic depiction of what would happen if the zombie apocalypse started in Australia. This story actually made me feel uneasy and still plays on my mind. I have been an avid fan of horror stories since early childhood. It didn't matter if the story came from books, comics or movies, as long as it was dark. My favourite stories were the tales that sounded like they might actually be true. As I entered my teenage years, the local library and video store featured among my regular haunts. Since my mid-teens, I have studied a variety of martial arts and I have been an avid fan of horror stories since early childhood. It didn't matter if the story came from books, comics or movies, as long as it was dark. My favourite stories were the tales that sounded like they might actually be true. As I entered my teenage years, the local library and video store featured among my regular haunts. Since my mid-teens, I have studied a variety of martial arts and self-defence styles. I rose through the ranks where I gained the opportunity to teach, and share my knowledge. Driven by my dark imagination and the ability to phrase things in a way that people instantly understand, I saw an opportunity to entertain as well as educate. I combined my life-long interest in horror stories with my many years of experience in self-defence to write my first novel Sleep With One Eye Open, in 2014. Many of my readers have contacted me to let me know they enjoyed the story because it was told in a way that they could imagine the horrific events taking place in the street outside their homes. Without exception, each one demanded to know when the sequel was scheduled for release. In September 2015 I completed Sleep With One Eye Open: GhostThe story is more unnerving than the original, and far more devious. Instead of quenching their thirst, this book only created more demand. In November 2017 I completed Sleep With One Eye Open: Shadow the third book in what has now become a series. I also write a blog on the first Thursday of each month. The posts are based on events and situations in my life that inspired me to become self-reliant and a resource for those around me. Blog topics including: self-defense, disaster preparedness, home security and camping tips.